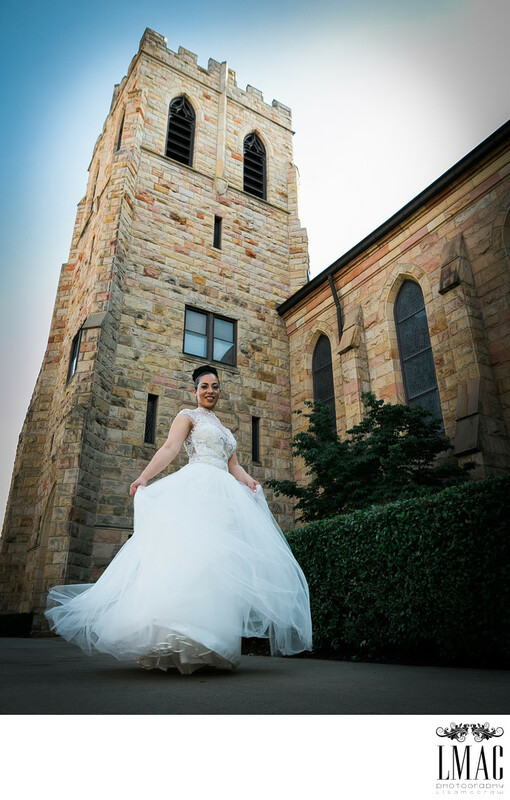 This beautiful bridal portrait is from the wedding of Rob and Chynell. One of the photos from this wedding was a finalist in the International Shoot and Share contest in 2017. It's also been a featured photo in an issue of Today's Bride Magazine. Their gorgeous wedding was held at The Old Stone Chapel in Canton, Ohio with their reception at The Historic Onesto Lofts in Canton, Ohio. The Historic Onesto Lofts is a stunning wedding location. Chynell was the perfect classic bride...her wedding dress was a gorgeous understated ballgown. Their wedding photos were absolutely gorgeous and we were proud to be the wedding photographers. This photo was shot at a church across from the Old Stone Chapel and it featured this beautiful red door, the perfect backdrop for a gorgeous bride and groom portrait. Location: 225 2nd St NW, Canton, OH 44702.